Making an appeal to the teachers, Chief Minister Raman Singh said that Government has fulfilled the promise and now it is the teachers to redirect their focus on improving quality of education with complete dedication and hard work. They should now prove the decision of Government was right. Recently, more than one lakh shikshakarmis were merged with school education department. Singh was addressing the people of sate in the 35th episode of monthly radio programme ‘Raman Ke Goth’ aired from Raipur centre of Akashwani on Sunday morning. It is the responsibility of the teachers to make children understand the basic importance of education and minute details of the subjects, said Chief Minister after congratulating all students on their admission to school. “Every school should have environment like that of a ‘Gurukul’, where teachers and students share affectionate bond,” Singh said. He also requested parents and guardians of the students to pay attention to their all round growth including education, recreation, sports, health, diet and good manners-moral values. Chief Minister said that panchayat and urban body teachers have been now merged with school education department. In the first phase, merger of those 1.3 lakh teachers having served for eight years and more as on July 1, 2018 as shikshakarmis. In the second phase, teachers having completed the service period of eight years, will be done. He said, with 12 days of cabinet’s decision, the merger order was issued. Now these teachers will get salary, allowances as per seventh pay commission, appointment on compassionate grounds, and promotion and transfer benefits of a regular government teacher effective from July 1, 2018. After merger, School Education Department will also commence the process of promotions. Salaries of these teachers will be hiked by Rs 7000- Rs 12000. Listing out many decisions and initiatives on part of government for education in state, Chief Minister said that regional offices of education department will also be opened in all the divisional headquarters of the state. Free textbooks are being distributed to all the students of 1st to 10th standards. In year 2003-04, 7.27 lakh copies of textbooks were distributed, now it has increased to more than 2.63 crores. In all the block headquarters of state and those areas under municipal corporation jurisdiction, this year, 152 primary and 152 middle schools are being run based on CBSE pattern. 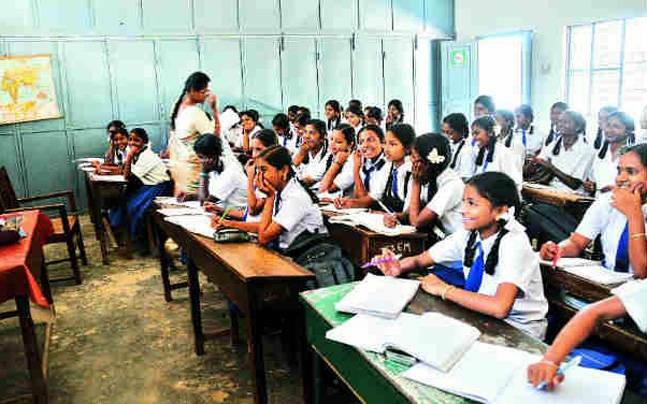 This year 129 middle schools have been upgraded as high schools and 130 high schools as higher secondary. Vocational course of agriculture has been included from this year in 100 higher secondary schools where around 3000 subject-experts teachers have been arranged with the help of Vidya Mitaan. Terming the decision of Prime Minister for historic hike of Rs 200 per quintal in the support price of paddy, Chief Minister thanked him. Now the farmers in state would have Rs 1750 per quintal minimum support price while Rs 300 would be added bonus on sold paddy. This it now totals Rs 2050 per quintal. Support price of corn has also been hiked by Rs 275, while prices of pulses, oilseeds and other products have also been hiked significantly. Further speaking for farmers, Chief Minister said that under Prime Minister Crop Insurance Scheme 14.60 lakh farmers of state were covered in year 2017-18, and Rs 1,294 crore was paid against the insurance claim. It is against the premium deposit of only Rs 359 crore. He intimated the listeners that 1500 mobile towers will be installed in state at the cost of Rs 450 crore under Sanchar Kranti Yojana to provide benefit of digital connectivity to people of rural areas. It will also expand mobile network in the state. Moreover, 50 lakh mobile phones will be distributed to rural families, urban poor families and college students. Installation of new towers will provide mobile coverage to 17 thousand villages of the state.